Wooden toys are a wonderful way to inspire imagination and development in young children. Wooden toys for toddlers are perfect for developing skills including hand-eye coordination, balance, memory, language and social skills, and even problem-solving. As opposed to many plastic and light-up toys, they’re also versatile and, with a little creativity, can be enjoyed in many different ways… plus, as a parent, you’ll reap the rewards of a calm and quiet environment in your home! Phew! Since they are composed of a natural material, wooden toys are thus, free of the many chemicals contained in other more mainstream options. Meaning, should your child decide to put one these items in their mouths, you can rest-assured that your baby or toddler’s gums and teeth will not be harmed in the process. Wooden toys are also not easily broken so, you won’t have to worry about your little one choking on broken pieces! Are you ready to discover the Top 10 Wooden Toys For Active Toddlers for ages 12-24 months and up? Then keep reading to see which ones have been approved by my little one and our circle of friends! Disclaimer: this post contains affiliate links meaning that should you choose to purchase an item using one, I could earn a small commission at no additional cost to you. All items mentioned have been included based on my personal experience with them. This is Marina’s favourite toys, hands down! She will play with it for up to an hour some days (at the time of writing this post, she is 22 months old). Toddlers can stack, match, and sort 25 different colourful wooden pieces of various shapes and sizes onto this Geometric Stacker Toddler Toy. Shapes include circular rings, octagons, and nesting rectangles. It’s the perfect toy for building recognition and differentiation skills at this age! Marina loves to say the names of the colours as she picks up the pieces to stack them on each of the three wooden poles. Chances are you’ve sung “Old MacDonald Had A Farm” to your little one at least a couple of times now, right? What better way to practice our animal sounds and names than this adorable knob puzzle! This Large Farm Jumbo Knob Puzzle features eight pieces, including a farmer and seven favourite farm animal pieces, that nest inside of a big red barn. A wonderful toy that builds hand-eye coordination, fine motor, and visual perception skills. Toddlers are able to pickup and navigate pieces into their designated slots by using the matching underlay image inside each piece’s designated empty space. This wooden toy can be used as early as 12 months old but from our own experience, didn’t get the serious playtime it receives now until about 18 months old. The perfect companion for little movers! See how this multi-purpose Wonder Wagon can go from confidence building walker to passenger vehicle. Your little one will love to push the handle of this award winning wagon (2015 Toy & Juvenille Products And Innovation Start Awards Gold Award) and explore with his or her favourite stuffies on board. Bunny is usually the passenger in ours! Encourage motor skill development and active play while building confidence from ages 12 months onwards and creativity in those older than 18 months. It’s even sturdy enough to hold another child… up to 50kg, wow! Social skills including communication, trust, and cooperation are also possible from this mega-multi-tasker! For convenient storage, the pull handle even folds up and locks into place. A total winner in our book too! This colourful and bright activity center is built on a charming tree top and has even won awards two awards in 2014 from Parents Magazine and Scholastic Parent & Child! Featuring four different sides and various activities, children as young as 12 months old can begin to enjoy this fun Tree Top Activity Center. Toddlers ages 18 months and up will love exploring each and everyone of these fun activities. The wood tree top activity center features 6 tracks with animal-themed gliders, 6 bead runs and colourful wooden beads, open and shut windows, and pinwheel spinners and is perfect for developing fine motor, social, and language skills. This is the classic when it comes to wooden train sets! Founded in Sweden in 1884, BRIO is the maker behind the original wooden railway. The Classic Figure 8 Set includes 22 pieces: an iconic three-section BRIO train, station, trees, crossing bridge, and 14 track sections. The age recommendation for this one is 2 years old but, since Marina found it just before her second birthday, we couldn’t resist giving it to her! It gives me such joy when she shouts “choo-choo” while pushing the train along the tracks. Perfect for creative play in addition to fine motor, language, and social skill development. We’re big fans of this adorable wooden scooter! This award winning Hape Ride On Balance Bike (including the 2013 Oppenheim Toy Portfolio Gold Seal Award and 2013 Parent’s Choice Recommended Award) features four wheels and lovely lime and forest green painted highlights against a wood base. Perfect for littles on the go or those just experimenting with their mobility skills. Use this wooden toy to help develop active motor skills as well as muscle strength and balance at home, or on the go, including trips to grandma’s house or even the park. It’s super durable and easy to transport! I knew I had to get Marina one of these when she became obsessed with our front door lock! The Melissa & Doug Wooden Latches Board features locks, latches, swing doors, and even fun pictures hiding beneath a few of them. Perfect for building fine and gross motor skills as well as language development. Your little one can learn colours, numbers, and animals playing with this entertaining board toy. Recommended for ages 3 and up although we have been safely playing with under supervision since 21 months old. Check out other reviews and see what feels comfortable for you! If you’re going to splurge on your little one, this is a must! While I am a big fan of all things IKEA, the Duktig kitchen was just missing something. Enter the KidKraft Vintage Kitchen! I love the size of this adorable play kitchen as well as the fact that it’s complete (hello, refrigerator). Little ones will have a blast open and closing doors (be sure to secure it against a wall, especially if you will allow children under 3 years of age to play with it), clicking and turning knobs, and organizing their food and cooking tools in generous storage space. An excellent wooden toy to develop language and social skills as well as creative play. Marina has a blast naming items (especially her favourite foods) and organizing all of the kitchen items. And, at 22 months, she’ll even pretend to cook, eat, and/or serve meals. This is a really fun one, especially for a stay at home parent who spends a lot of time playing with her toddler! This 2013 Play Advances Language and 2014 Parent’s Choice Recommended Award winning pull toy is fun from ages 12 months to 5 years! 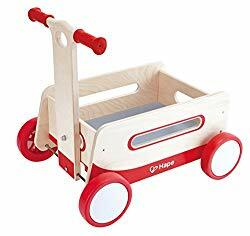 The Hape Walk-A-Long Snail Shape Sorter multi-tasks as it holds a shell full of wooden blocks and waves its tail while your little one pulls it to his or her next destination. The colourful shape sorter is removable and kids can empty it out to lighten the load or sort its pieces. There are three holes of different shapes (triangle, circle, and a square) to differentiate and on the opposite side, an elastic-banded opening to allow little hands easy access to pieces inside of the shell. An excellent choice for developing little imaginations and creative play as well as motor skills like movement and problem-solving. Little ones will learn to recognize shapes and colours. An excellent alternative to light up and musical doll houses! The Hape All Season Kids Wooden Doll House features six different rooms, moveable stairs, and a reversible winter/summer decorated solar-panelled roof. Four room sets are also included (Master Bedroom, a Bathroom, a Entertainment Room, and Kitchen). This neutral coloured doll house encourages the development of little imaginations in its ability to promote creative play and imitation. Your little one will learn social skills including communication, cooperation, and language development. The perfect doll house for the minimalist home and parent. Which of the above wooden toys for toddlers was your favourite? Does your little one have a special toy that should be added to the list? I’d love to hear from you in the comments below!